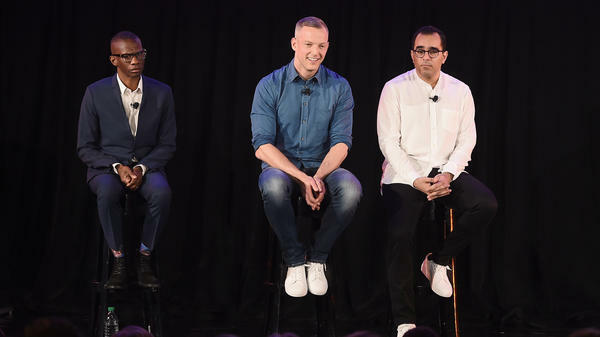 Spotify executives Gustav Söderström, Troy Carter and Babar Zafar answer questions at a press conference in New York City on April 24. This morning in New York City, the streaming giant Spotify -- which began publicly trading earlier this month and has a current valuation of $28 billion -- held a press conference to announce changes to the free version of its mobile app for both iOS and Android. The company hopes that these new features, which will be rolled out in the weeks ahead, will create a sizable increase in its user numbers globally. The company says that these changes to music fans' experience on its mobile, ad-supported app — which include 15 personalized "music discovery" playlists in which listeners can hear full songs on-demand as well as an optional "data saver" function, which reduces the amount of mobile data the app uses by up to 75 percent — will entice even more users to its free tier. Spotify's in-house playlists, such as Rap Caviar and Viva Latino, are important drivers of exposure (and by extension, revenue) for record labels and artists. Some 90 million people currently use the free tier worldwide, while 71 million pay for its subscription service. As NPR has previously reported, 90 percent of the company's revenues come from subscriptions, not free listening. Spotify argues that a large uptick in free-tier users could result in big gains for content creators and rights holders — mostly in terms of potential exposure to new fans. Even so, referring to the recorded music industry's glory days of peak sales, Gustav Söderström, Spotify's chief research and development officer, promised, "This will make the 1990s look like a practice run." Overall, streaming is continuing to grow quickly: according to the 2017 International Federation of the Phonographic Industry (IFPI) report, which was issued today, streaming revenue grew 41 percent last year, while download revenues declined by 20.5 percent and physical revenues went down 5 percent. During Spotify's investor-day presentation last month, Spotify co-founder and CEO Daniel Ek stated that his company was working on launching its platform in some of the world's most populous markets, including India, China and across Africa. The reduced data load that Spotify promised today has the potential to make its streaming services far more friendly to users in those countries. With these moves, Spotify is continuing to employ the classic tech-company strategy of scale-before-profit in the hopes of holding onto its first place in the music streaming marketplace, while Apple Music has amassed its 38 million subscribers to its service in just less than three years. During a Q&A session with journalists that followed the presentation, Spotify executives were asked whether or not, with these changes to its mobile offerings and its emphasis on its free, ad-supported tier worldwide, the company would readdress or increase its payments to artists and labels. The answer was no. Spotify is positioning its free service as a competitor to terrestrial radio worldwide, not to mention more direct competitors such as Apple Music, and that Spotify pays more to artists and rights holders than terrestrial commercial radio does. Söderström noted that radio was once the main vehicle for artist promotion, and that music fans then turned to record stores to buy music. Spotify's global head of creator services, Troy Carter (who formerly managed Lady Gaga and continues to manage Meghan Trainor, Kamasi Washington and Charlie Puth through his company Atom Factory), said that unlike the one-time profit that comes with selling a physical disc or vinyl album, streaming provides an ongoing source of revenue for artists. But, he acknowledged that with its much lower payout rates, streaming is a "paradigm shift" for artists. "We're focusing on scale," Carter added. "The bigger we get, the more we pay out."